The preview edition of Solar & Storage Today, the free daily newspaper of Solar & Storage Live, is now free to download. 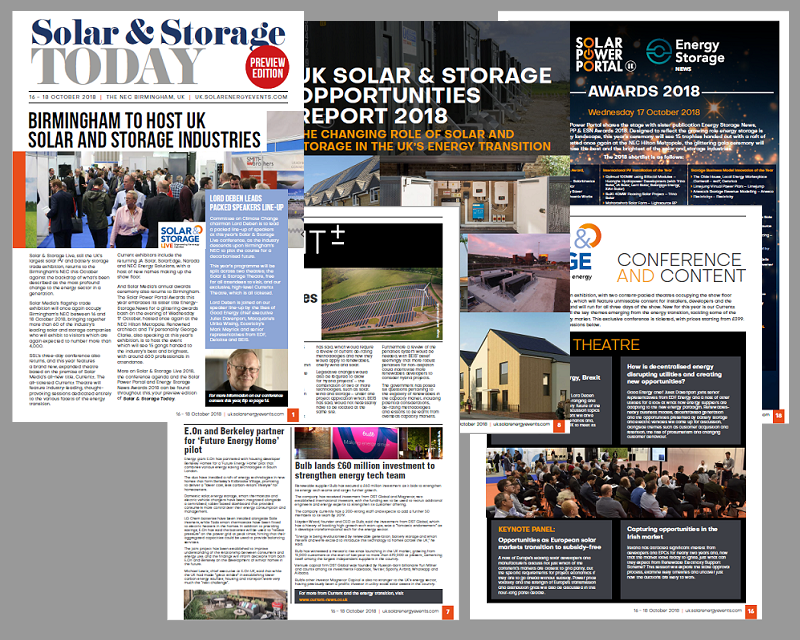 Each year at Solar & Storage Live, still the UK’s largest gathering of the solar and storage supply chain, Solar Media’s editorial team publish daily newspapers to keep visitors and delegates abreast of all the show news, views and opinion. The preview edition is designed to introduce the exhibition, its industry-leading content and the most pressing themes which will be the subject of discussion at Birmingham’s NEC. And this year’s preview also includes a special eight-page report on the solar and storage opportunities in the UK market. The preview can be downloaded, entirely for free, here. Solar & Storage Live is held at Birmingham’s NEC between 16 – 18 October. The three-day show will feature more than 60 exhibitors and two jam-packed content theatres. More than 4,000 industry stakeholders are expected to attend over the three days. Visitor registration is once again COMPLETELY FREE, with tickets for the exclusive Current± Theatre available to purchase here. Ticket prices at the early bird rate are available until 14 September. The show also coincides with the Solar Power Portal and Energy Storage News Awards, which takes place on the evening of Wednesday 17 October 2018. A limited number of tickets for the awards ceremony are still available and can be purchased here.